John Friedenbach, general manager of the Humboldt Bay Municipal Water District, told the Journal today that his agency plans to appeal the Humboldt County Planning Commission's Jan. 12 decision to recommend rezoning of a parcel adjacent to the Mad River in Glendale. The property, owned by the Mercer Fraser Co., is currently in use as a gravel quarry and slated to become the future home of a cannabis extraction operation. This necessitated its rezoning for heavy industrial use. Citing concerns about possible contamination of the county water supply, Friedenbach was joined by most of his staff and several community members to speak out during public comment at the commission's Jan. 11 meeting. Although the proposal includes a closed-loop system that would ostensibly protect against contamination of the water table, the site is on a flood plain, meaning that a natural disaster could potentially result in dangerous chemicals being swept into the water system, putting the health of thousands of Humboldt County residents at risk. 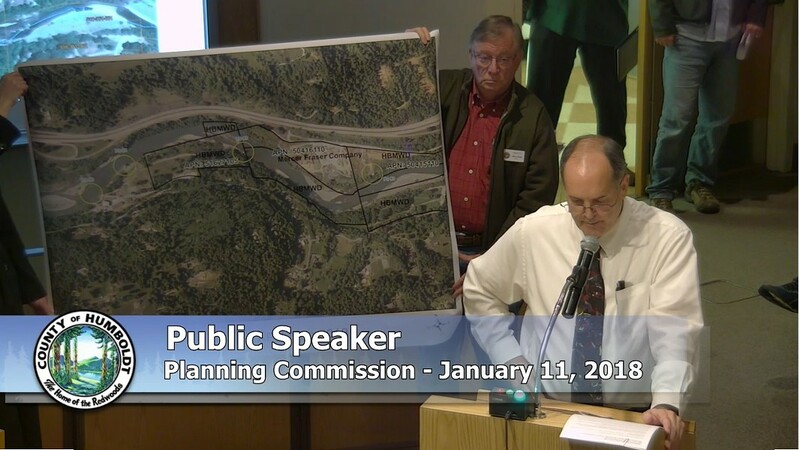 "Any contamination originating from the applicant’s parcel would immediately impact up to three (75 percent) of our domestic water supply sources,” Friedenbach wrote in his initial letter to the commission. Despite this pushback, the planning commission ultimately voted 3-2 to approve the zoning change. Planning Commissioners Alan Bongio and Brian Mitchell abstained from the vote, with Bongio later saying that as a member of the Humboldt Community Services District his participation would be a conflict of interest. Friedenbach said the water district board held an emergency meeting last week and ultimately decided to appeal that decision, which means they it have to file paperwork by Friday and pay $2,260. The Board of Supervisors are slated to decide the issue Feb. 27. "It's a pricey appeal, but it's worth it," he told the Journal this morning. "Simultaneously, our board directed staff to negotiate with Mercer Fraser on permit restrictions." Asked how he felt once the planning commission had made its Jan. 12 decision, Friedenbach said he was "disappointed." "I think the interests of the majority of the population of Humboldt County should be more important than the interests of one company to start a cannabis corporation." Editor's Note: This story was updated to reflect additional information regarding Alan Bongio's abstention from the vote.